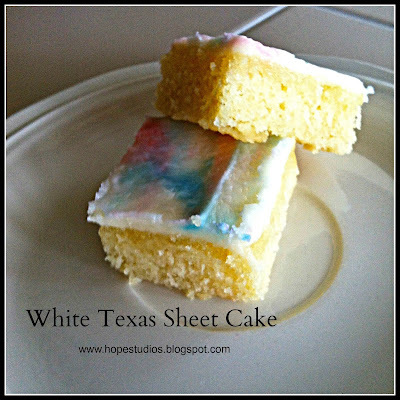 So, Texas Sheet Cake is chocolate, right? Wrong! My sister-in-law brought this fantastic White Texas Sheet Cake for our family's Mother's Day dinner and it was love at first taste so I made one for 4th of July this year. Really easy prep and clean up since all ingredients are made in one saucepan! Pour into a greased 15-in. x 10-in. x 1-in. baking pan. Bake at 375° for 18-22 minutes or until golden brown ( I baked mine about 15 mines until set but not brown and a toothpick inserted near the center comes out clean. Cool on a wire rack for 20 minutes. To make frosting, in a large saucepan, bring butter and milk just to a boil. Immediately remove from the heat; stir in confectioners' sugar and extract. (the original recipe calls for 1 cup of chopped walnuts mixed into frosting that I omitted). Spread frosting over warm cake. Cool completely.